Jerome Searing is an orderly for the Federal army. His general sends him on a mission to scout ahead and make sure that there are no surprises waiting for them. This is a typical mission for Jerome and he takes delight and care in scouting ahead. He comes upon a planation and can see the Confederate army in retreat. He takes aim to shoot one of them just make there one less solider but at the same time, a captain far off shoots a cannon at the structure that Jerome is hiding in. When Jerome comes to, he is partially buried in the debry and finds himself incapable of moving his body because of the the way the debris covers him. As he examines his surroundings and options, he realizes that his rifle is pointed right at him. He anticipates it going off at any minute since it was primed to fire before the explosion. He tries to distract himself from metal ring facing him with other thoughts and even by closing his eyes but every time he closes his eyes, he feels the bullet burying into him. Eventually, he finds a loose board that he tries to use to block the gun but when that is ineffective and he has lost all hope, he uses the board to help pull the trigger. The gun doesn't go off; it was fired when the building collapsed. Yet the potential firing was enough to send Jerome to his death. Later, his brother, Adrian Searing is ordered to move forward and explore the area that his brother has scouted. As they pass the destroyed building, they see a body in the wreckage but the debris has tinted his Federal coat gray and the state of death hints that the body had been dead much long so none of them realize who they are looking at. 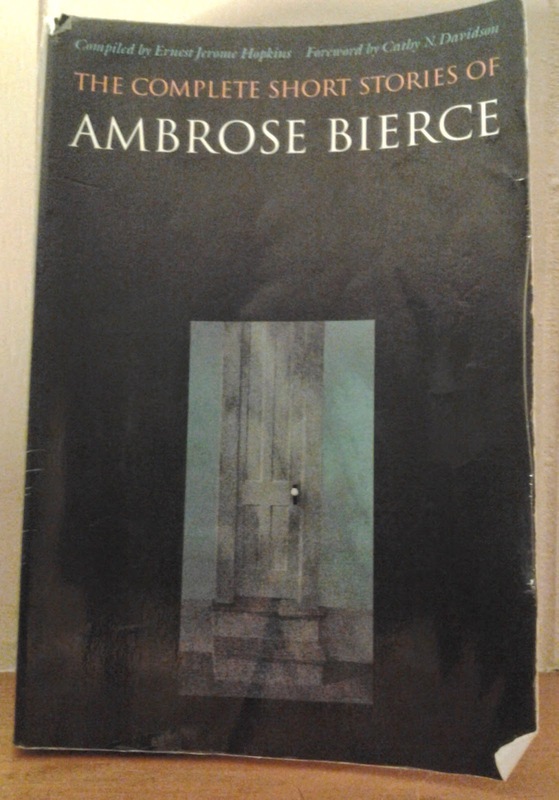 I rather liked this tale by Bierce. It's one of his stronger ones by far and has elements that are parallel with Chickamauga and The Occurence At Owl Creek Bridge. Of course, the naming (Searing) was well chosen in that so much of the story is consumed by a bullet potentially searing his brain. But there is also irony in that Searing's goal to make a widow and orphan of some solidier by shooting the retreating Confederate army is exactly what he does by staying too long and getting killed himself. Bierce also captured the stress and challenge of staring down a gun for a long time. It's definitely a worthwhile read among his works.